Join us for our year-long celebration of the USA World Premiere Movie in conjunction with Made-for-TV Mayhem! Check out out previous entries on THE FORGOTTEN here, MURDER BY NIGHT here, THE TICKET here, SNOW KILL here, DEADLY GAME here, ACCIDENTAL MEETING here, HITLER’S DAUGHTER here, ARE YOU LONESOME TONIGHT? here, AS GOOD AS DEAD here, MURDER ON SHADOW MOUNTAIN here, TRUCKS here, OUR MOTHER’S MURDER here , THE HOLLYWOOD DETECTIVE here, ULTIMATE DECEPTION here, NIGHTMARE ON THE 13TH FLOOR here, WRITER’S BLOCK here, THE CHIPPENDALES MURDER here, RUBDOWN here, THE SUBSTITUTE here, THE CHINA LAKE MURDERS here, DIAMOND FLEECE here, RUNNING AGAINST TIME here, MY STEPSON, MY LOVER here and THE HAUNTING OF SEACLIFF INN here!, MURDER 101 here, TAINTED BLOOD here, BURIED ALIVE here, PSYCHIC here, SCANDALOUS ME: THE JACQUELINE SUSANN STORY here, INTO THE BADLANDS here, LIES OF THE TWINS here, CABIN BY THE LAKE here, VOYAGE here, RETURN TO CABIN BY THE LAKE here, WHITE LIE here, SINS OF THE MIND here, DUPLICATES here, MATERNAL INSTINCTS here, DEAD HUSBANDS here and THE HAUNTING OF SARAH HARDY here, CHILD OF DARKNESS, CHILD OF LIGHT here, HIGH DESERT KILL here, I’M DANGEROUS TONIGHT here, THE COVER GIRL MURDERS here, RATTLED here, DEATH BENEFIT here, TRILOGY OF TERROR II here, LIGHTNING FIELD here, THE PERFECT BRIDE here and HUSH LITTLE BABY and BABY MONITOR: SOUND OF FEAR here! The late 1980s and early 1990s produced an odd subgenre of vampire films. 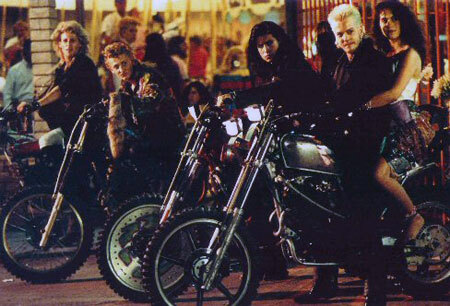 Perhaps spurred by the big-screen escapades of FRIGHT NIGHT, THE LOST BOYS, NEAR DARK and ONCE BITTEN, vampires were an oddly hot commodity for low-budget filmmakers, who revisited old bloodsucker myths with wild abandon and an endless supply of neon lights. They drove cabs (GRAVEYARD SHIFT), played pool (BILLY THE KID MEETS THE GREEN BLAIZE VAMPIRE), tried to find a cure for bloodlust (SUNDOWN: THE VAMPIRE IN RETREAT, A RETURN TO SALEM’S LOT), got hitched (I MARRIED A VAMPIRE), palled around in high school (MY BEST FRIEND IS A VAMPIRE), held parties (THE WICKED), performed musical numbers (SATURDAY THE 14TH STRIKES BACK) and visited movie sets (THE UNDERSTUDY: GRAVEYARD SHIFT II). There was also VAMPIRE AT MIDNIGHT, TO DIE FOR, TO DIE FOR 2: SON OF DARKNESS, VAMPIRE’S KISS, DRACULA’S WIDOW, THE LAIR OF THE WHITE WORM, TEEN VAMP, VAMPIRES ON BIKINI BEACH, DANCE OF THE DAMNED, THE JITTERS, BEVERLY HILLS VAMP, ROCKULA, TRANSYLVANIA TWIST—hell, I’m getting a headache just looking at having to format all of these titles. But these films had more in common than their fangs – they also shared a similar positioning of their tongue, placing it in cheek to varying degrees. Sure, some were more serious than others, but most low-budget vampire titles of the era had one thing in common – they weren’t supposed to be taken completely seriously, with even darker tales like TO DIE FOR occasionally veering into knowing camp. It was as though LOVE AT FIRST BITE had suddenly exploded in influence across the world’s word processors, and the once-frightening bloodsuckers were now just figureheads to sell something at least a little bit goofy. Sure, the vampires themselves were often gothic and brooding, but the situations they found themselves in were often of a, well, goofier nature. It’s not as though there’s anything wrong with that, as it’s certainly possible to blend horror and humor well. NIGHTLIFE, a darkly comic vampire story that marked the USA Network’s sole foray into the world of the bloodsucker, does with a degree of care, and while it’s tonally all over the place, it’s still an enjoyable ride, as every actor involved seems to bring a different genre of film to the table. Our tale begins in Mexico City, as a newly unearthed tomb brings Angelique (Maryam d’Abo) back to life. She’s understandably confused by the new world she’s in, as she’s been “sleeping” for a hundred years or so and quickly becomes confused by cars, night clubs, and basically everything else around her. Meanwhile, her presence is pursued by her former lover Vlad (Ben Cross) and his two vampire assistants (Glenn Shadix and Oliver Clark, both underused) – a pursuit Angelique may or may not actually want. See, Angelique needs blood but has no desire to kill for it, a personality trait she doesn’t share with Vlad. So when she passes out at a blood bank (she tried to withdraw) and meets kindly Dr. Zuckerman (Golden Years star Keith Szarabajka, more recently of Sons Of Anarchy and THE DARK KNIGHT) who thinks her bloodlust is some sort of treatable disease, it’s love at first… no, I’m not going to go that route. It’s too easy. NIGHTLIFE is an odd mesh of genres, with the relationship between Zuckerman and Angelique coming off like a perfectly pleasant little supernatural romance and Vlad’s pursuit delving in to outright horror as Cross seems to be playing an ever darker version of the bloodsucking character he’d soon play in the Dark Shadows remake a year later. And there’s Rosa (Camille Saviola), Angelique’s Mexican housekeeper, a comic relief character who’s pretty lackadaisical about the whole vampire deal. “Quirky” is a fair way to describe it, and on that level, NIGHTLIFE succeeds. Director Daniel Taplitz (who followed this with a pair of quirky supernatural oddities, BLACK MAGIC and COMMANDMENTS) allows for some clever ideas and the actors do a find job with the dialogue, even if they often seem to all be reciting it in different movies. There are some stumbles (like a dream sequence in which Dr. Zuckerman references this commercial – except with “Blood” instead of “Bud!”) and a ridiculous climax that involves Rosa and Vlad doing the tango (! ), but it’s still a strangely affable film. Next [THE BIG QUESTION] WHAT WAS YOUR FAVORITE NON-2014 MOVIE OF 2014?